This is a bundle of 4. To buy the designs individual click on the link in the description or use the search function on the website. This 1st design in this small series of small fruit pictures shows one beautiful juicy and shining ripe Pear – filled with Special Stitches galore and framed with a beautiful and decorative frame. You will use normal cross stitch and Special Stitches, normal DMC cotton floss as well as beautiful silk fibers etc. and adorn the entire embroidery with some beads too. 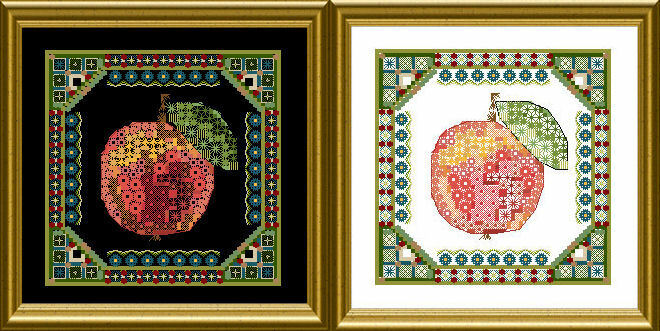 This 2nd design in this small series of small fruit pictures shows one beautiful ripe and colored Apple – filled with Special Stitches galore and framed with a beautiful and decorative frame. 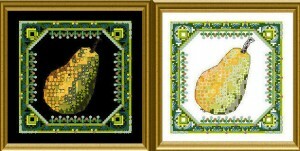 This 3rd design in this small series of small fruit pictures shows some exotic and ripe Pineapples – filled with Special Stitches galore and framed with a beautiful and decorative frame. 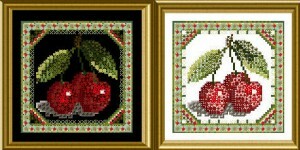 This 4th design in this small series of small fruit pictures shows some juicy and seductive cherries – filled with Special Stitches galore and framed with a beautiful and decorative frame. at chatelaine.de you purchase the PDF-Pattern only. 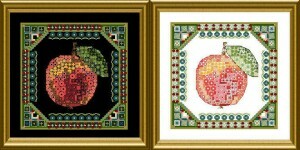 For supplies I can recommend European Crosstitch (https://european-crosstitch-company.myshopify.com).